Last week in the early hours of the morning my husband was getting ready for work and accidentally spilled his coffee. He did put a towel on it and soak it up some but he didn’t have time to clean it properly. When I came down later that morning I saw the towel and spill and planned to clean it up as soon as I got the kids all on the bus to school. It became one of those days where things just were not going as planned and when the kids got home the spot was still there and remained there until today. With 4 kids and 3 dogs messes are not uncommon and I have a little green machine to spot treat as well as a full size steam cleaner. We have light colored carpet that I have grown to hate because it is a dirt magnet so cleaning carpets happens on a semi regular basis around here. The only problem is I have yet to find a cleaning solution that works well. I have used different store-bought solutions hoping each one was better than the next but I never found one that got my carpets really clean. I then started trying different DIY solutions that I found by Googling or by Pinterest. Want to know what happened when I put solutions with dawn dish soap in my carpet cleaner? Bubble-geddon, that is what. It was a combo of bubbles coming out of the machine and dumping the dirty water container because it wasn’t full of dirty water but soap bubbles. While it took longer my carpet was cleaner than when using the different store- bought solutions but I wasn’t thrilled with the results. Back to the internet I went searching for a solution. While searching for a solution I repeatedly read that soap leaves behind residue that attracts dirt! 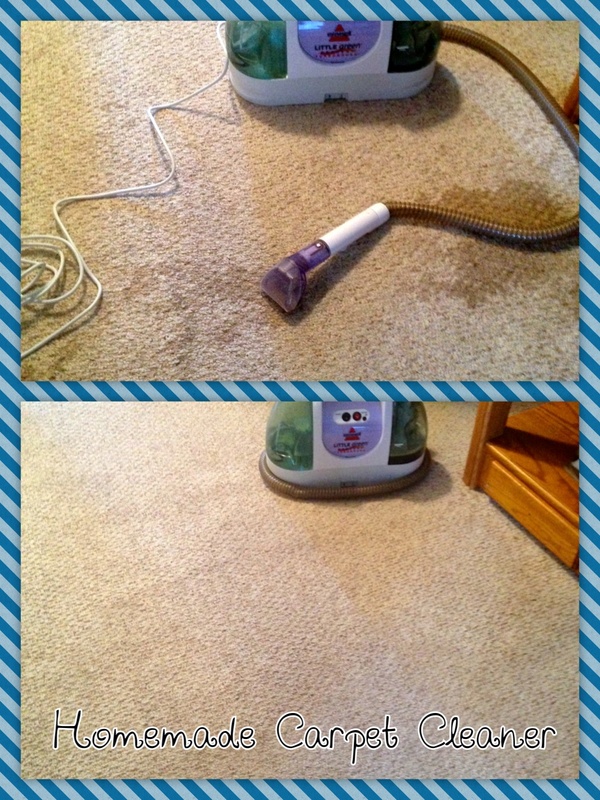 My journey then became how to clean my carpet without detergent. What I found were different combinations of borax, oxyclean, hydrogen peroxide, white vinegar, fabric softener, baking soda and hot water. So I experimented and found a combination that worked well and is now my go-to Homemade Carpet Cleaner. After cleaning up an almost week old black coffee stain with ease I knew this was the homemade carpet cleaner for me! In the clean water tank of your carpet cleaner add baking soda, peroxide and vinegar. Add hot tap water to the fill line. After closing tank gently shake to make sure your your solution is thoroughly mixed. Pretreat stains as needed and follow your carpet cleaner’s instructions for cleaning. Great tip! I always love finding a homemade solution to cleaning problems! I love natural cleaning solutions! When it comes to the stains on the carpet I’ve always used very strong toxic products! I will be happy if I change this! Thanks for sharing! So amazing ideas for home made natural cleaning! I think that here I found magnificent ideas! A good place for carpet cleaning is the Carpet Cleaning in Bow. Regards!